The largest hotel to open this year in Chicago, and the largest Marriott to open in North America in 2017, the Marriott Marquis Chicago brings 1,205 guest rooms, including 44 suites, to the burgeoning entertainment and convention district of McCormick Square. 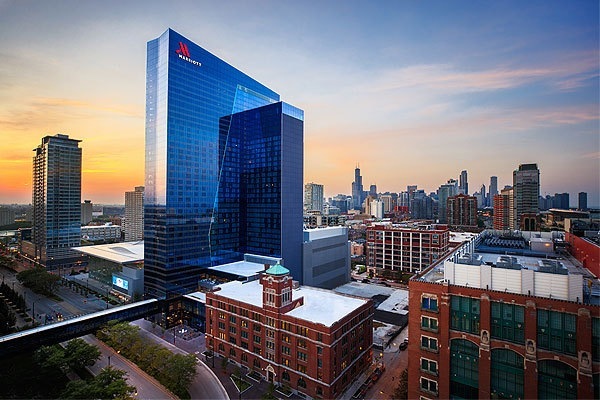 Marriott Marquis Chicago is directly connected to the country’s largest convention center, McCormick Place, and is adjacent to the new 10,000-seat Wintrust Arena. Beyond its immense 40-story presence, the arrival of the hotel revolutionizes meeting and business accommodation standards in Chicago. The hotel is rooted in the ethos of Chicago, with a strong, unpretentious and clean contemporary design. The new modern glass hotel connects to the historic American Book Company building, originally built in 1912, creating a unique architectural juxtaposition of old meets new. 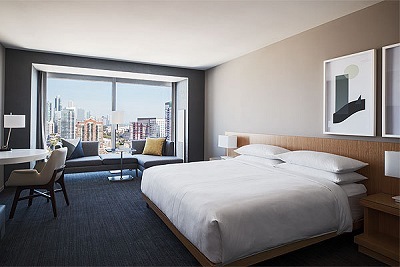 Guestrooms feature a grey-and-white color scheme to complement the city views outside. To further invite the city in, each room features unique lightbox artwork – the first of its kind within a hotel room – depicting various Chicago bridges and locations. Of the 1,161 regular guest rooms, there are 26 club kings, 461 kings, and 674 doubles. The property boasts 93,000-square-feet of high-tech meeting and event space, including two 25,000-square-foot ballrooms and 43,000-square-feet of breakout meeting rooms. The Junior and Grand ballrooms, meant for corporate and social functions, are amongst the largest in the city and the only ones to feature dramatic views of the city skyline. Each ballroom has a floating ceiling plane comprised of repetitive angles that add creative depth and dimension to the 30-foot ceilings. The American Book Company building boasts 29 meeting rooms varying in size, along with centralized lounges with soft seating and charging areas on each floor. A 4,000-square-foot event space on the 33rd floor will open later this year and ensure a stunning atmosphere, with floor-to-ceiling windows offering unobstructed 180-degree views of Chicago and Lake Michigan. 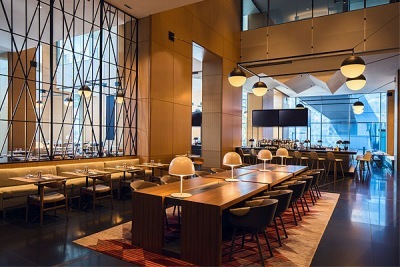 The hotel features the signature Marriott two-story Great Room with a Grab ‘n Go market called 2121 Pantry, which serves quick, fresh bites that can be enjoyed throughout the hotel and offered as room service. A U-shaped bar anchors the large space, and a community kitchen can be seen through glass paneling, with the space serving as a private dining room or intimate chef’s table for special dinners. Additional hotel amenities include fiber optic high-speed internet connectivity, a state-of-the-art fitness facility open 24 hours a day and the M Club Lounge, an elevated space offering Marriott Reward members a variety of luxuries, including a sophisticated workspace and complimentary breakfast, appetizers and cocktails. Access to the M Club Lounge can also be added to any guest’s stay for an additional fee. There is also a business center and FedEx office on property as an added convenience for guests. The hotel is Chicago’s sixth largest in terms of guestrooms, behind the Hyatt Regency Chicago, Palmer House, Hilton Chicago, Hyatt Regency McCormick Place and Sheraton Grand Chicago.